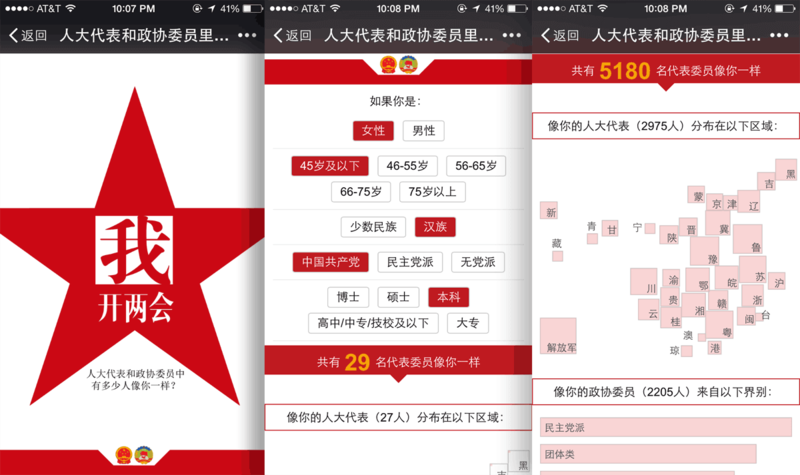 I worked with my friend at a Chinese online media, The Paper, on a mobile-based visualization during the annual meetings of the Chinese National People's Congress (NPC) and National Committee of the People's Political Consultative Conference (CPPCC) in 2015. The project exposed the homogeneous nature of the Chinese Congress, which composes dominantly of old men of the Han race who are members of the Communist Party. Users can select demographic features and see the number of Congress members who fall into the demographics. The project was eventually not allowed to publishe due to orders from the higher-ups at The Paper. This interactive from The Guardian served as an inspiration for this project.